Superstructured Thin Film Chemistry group (M. Kawasaki group) has successfully enhanced the output power of ZnO light emitting diodes under the collaboration with RHOM Co. Ltd. and IMRAM Tohoku University. 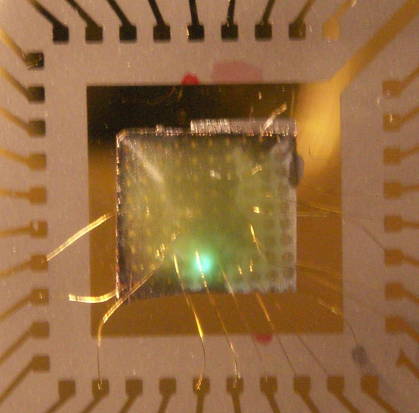 The devices were made with molecular beam epitaxy technique on conducting ZnO substrates, which are suitable choices for mass production. It is expected to pave a way for low-cost, high-efficiency, and energy-saving illumination. This result has become public in Applied Physics Letters (online publication) on July 6th. Such press sources as Nikkei-Sangyo, Nikkan-Kogyou (June 30) and Kahoku-Shinpo (July 2) introduced the achievement.